Futronic's FS80H USB2.0 Fingerprint Scanner uses advanced CMOS sensortechnology and precise optical system to deliver high qualityfingerprint image. It can capture an almost un-distorted rawfingerprint image into PC in 100ms and is good for any fingerprintrecognition application. The finger scanning window is a crown glass with a thickness of14mm. It is much more reliable and robust compared to any semiconductortype fingerprint sensor. The finger is illuminated by 4 infra-red LEDs during scanning andthe light intensity is automatically adjusted according to scanningfingerprint's characteristics (wet, dry, blurred, etc) to optimize thequality of the captured fingerprint image. 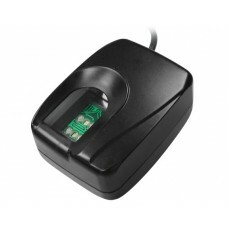 The Futronic FS80H USB 2.0 Reader is compatible with many differentsoftwaredevelopment kits and applications. Below is the list of productsthat are currently known to support this scanner. Please notethat some applications and development kits require specific versionsof the drivers to be installed. Please contact us if you needadditional information.